ADG Ethiopia provided six diaspora initiatives with £25,000 each for economic development activities. One of these grants went to Addis Fine Art, a gallery specialising in contemporary African Art, with particular focus on art from Ethiopia and its diaspora. 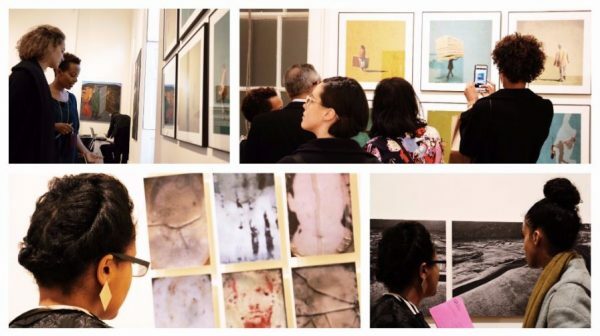 AFA provides a local space and an international platform for the promotion and sale of visual arts from Ethiopia, with the aim of increasing the visibility, international market access and securing sustainable careers of visual artists in Ethiopia and its diaspora. AFA is based in Addis Ababa, Ethiopia and in London, UK. AFA were able to present artists: Merikokeb Berhanu (b.1977), Girma Berta (b.1990), Wosene Worke Kosrof (b.1950), Leikun Nahusenay (b.1982) and Michael Tsegaye (b.1975) at the fourth edition of 1:54 Contemporary African Art Fair, which took place at Somerset House, London from 6 – 9 October 2016. Initiated by Touria El Glaoui, 1:54 is the leading international art fair dedicated to contemporary art from Africa and its diaspora. Through its presence at the fair, AFA has raised both its visibility and that of its current artists, which has given a tangible boost to the Ethiopian visual arts markets, internationally. Visual artists in Ethiopia receive very little support in building their local market and international presence. There are no public funding programmes and almost no commercial galleries to sell and promote artists’ work, and provide them with strong and sustainable careers. Most artists have to rely on a limited number of cultural spaces funded by foreign embassies to show their art. A large proportion of artists leave the profession, fall into extreme poverty or leave the country to pursue their careers. Despite the increasing interest in art from this region, emerging local artists face insurmountable obstacles and have very little external support while doing so, until now. AFA has established the first professional contemporary art gallery located in the economic heart of Ethiopia’s capital city. The gallery has been set up with the same level of expertise, systems and standards of an international gallery and therefore, can compete with young galleries globally. Digitally, AFA has invested in developing a ‘best in class’ website, to establish its position as a key player in the growing online arts market. It has grown its audience through its profile on the most significant digital social media platforms, and has established strategic partnerships with leading online art market companies such as www.artsy.net. This puts AFA side by side with galleries from across the globe in the virtual market place. Locally, AFA has created a gold standard in exhibitions igniting the local collector base. To find out more about AFA and their work, please click here. To find out more about AFA’s artists. Please click here.